Manchester City will be hoping to keep up the pressure on Premier League leaders Liverpool, when they take on AFC Bournemouth on Saturday. Reigning Premier League champions Manchester City will travel to the Vitality Stadium this weekend, as they gear up to take on Eddie Howe’s AFC Bournemouth in matchweek 29. Manchester City got their hands on the first silverware of the season last weekend, when they edged past Chelsea in a penalty shootout to retain the Carabao Cup. Following the triumph, Pep Guardiola’s men were made to work hard by West Ham United, as they came out with a narrow 1-0 win to stay in touch with Liverpool at the top of the table. With Jurgen Klopp’s side scheduled to play Everton in the Merseyside derby on Sunday evening, Manchester City have a great chance to open up a two-point lead over their rivals with a victory at the Vitality Stadium. Bournemouth, on the other hand, are coming into the game on the back of a 5-1 mauling at the hands of Arsenal during the week. The Cherries have failed to pick up all three points for four games in a row now, with their last victory coming against Chelsea in January. The winless run has seen them drop down to 12th on the table. Eddie Howe’s side can, however, take confidence from the fact that they are on a run of five unbeaten games at home in the Premier League and having seen West Ham make life difficult for the champions, they will back themselves to put up a strong fight on Saturday. The reverse fixture at the Etihad Stadium ended in a 3-1 win for Manchester City and ahead of the crucial encounter at the weekend, we at The Hard Tackle take a closer look at both teams. Howe has a series of injury headaches coming into the weekend match against Manchester City. Defensive mainstay Steve Cook is sidelined with a groin problem, while attacking duo Junior Stanislas and Dominic Solanke have also been ruled of the tie. Star striker Callum Wilson will be assessed close to the game, but is unlikely to start. Jefferson Lerma is suspended. Artur Boruc had a torrid outing against Arsenal last time out, but is likely to be retained in goal ahead of Asmir Begovic. Nathan Ake and Chris Mepham will form the central defensive partnership duo for Bournemouth. The youngsters will have their task cut out against the brilliant Sergio Aguero. On-loan defender Nathaniel Clyne should continue as the right-back, while Charlie Daniels is expected to replace Adam Smith on the opposite side. Both the full-backs are likely to kept occupied by the Manchester City wide men, meaning they are unlikely to offer much in terms of attacking output. The fit again David Brooks should return to the starting XI out on the right flank, while Scotsman Ryan Fraser will take up the left side of the midfield. The duo will be key to Bournemouth creating chances on the day, while Dan Gosling and Andrew Surman will hold the fort in the middle of the park. With Wilson still not ready for a start yet, Josh King and Lys Mousset, who scored Bournemouth’s only goal against Arsenal, will continue as the two-pronged strike force. Manchester City continue to be hampered by the absence of two key men – Aymeric Laporte and Fernandinho, both of whom picked up injuries during the Carabao Cup final. Fabian Delph has returned to training, but will not be involved. The visitors have been boosted by the return to full fitness of John Stones and Gabriel Jesus. Ederson’s selection is an absolute given in the starting lineup, while Oleksandr Zinchenko is expected to continue at left-back with Benjamin Mendy still not fully fit. John Stones should return to the side at the heart of the defence, partnering Nicolas Otamendi, while Danilo is likely to be replaced by Kyle Walker at right-back. In Fernandinho’s absence, German midfielder Ilkay Gundogan is expected to continue as the deepest of the three central midfielders for the Citizens. Operating on either side of the German will be Kevin De Bruyne and David Silva, who will be the chief sources of creativity for the visitors at Dean Court. Up ahead, despite Jesus’ return, Sergio Aguero is likely to be stuck with as the No. 9 for City. The Argentine forward will be flanked by Bernardo Silva and Raheem Sterling, both of whom were not part of the starting lineup for the midweek fixture. Bournemouth have never beaten Manchester City in their 13 previous league meetings (D2 L11). Manchester City have won all seven Premier League meetings with Bournemouth, scoring 24 goals and conceding just three. The Citizens’ 100% win record in seven games against Bournemouth is their best in Premier League history and the joint-best in top-flight history, along with Brighton & Hove Albion against Wolves (also seven wins out of seven). Bournemouth have lost 10 of their last 12 home Premier League matches against the ‘Big Six’ teams, beating Arsenal in January 2018 (2-1) and Chelsea in their last such game (4-0) in January earlier this year. Manchester City have lost three of their last six Premier League away games (W3), more than they had in their previous 34 on the road (W26 D6 L2). 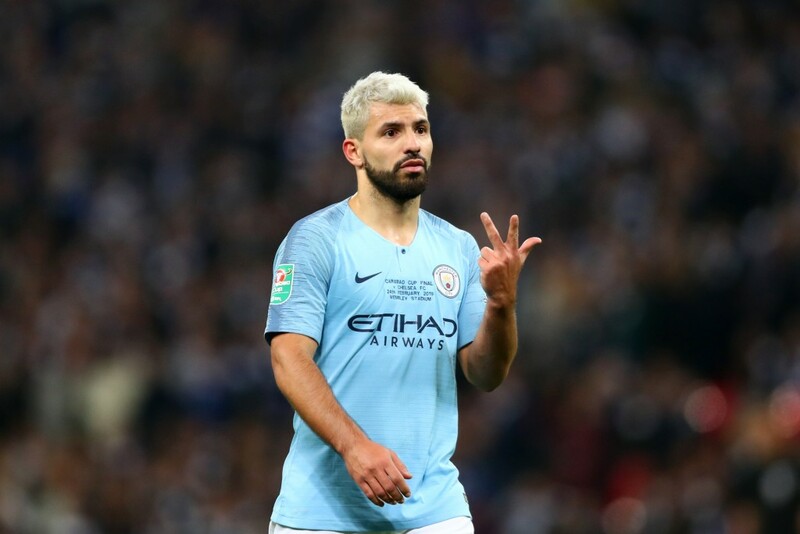 Following his nerveless penalty against West Ham United during the midweek round of fixtures, Aguero became the leading goalscorer in the 2018-19 Premier League, with 18 strikes against his name. The Argentine forward has 25 goals in 33 matches in all competitions this term, scoring at an amazing rate of a goal every 96 minutes. However, there is a reason for concern for Manchester City ahead of their visit to the Vitality Stadium on Saturday, as the 30-year-old has found the back of the net on just three occasions away from home in the Premier League this season. Moreover, Gabriel Jesus’ recent injury has meant that Aguero has been overworked to some extent by Guardiola. With Liverpool looking dangerous again, following their 5-0 win against Watford, Manchester City cannot afford any slip-ups and they will need Aguero to beat the fatigue and keep firing on all cylinders till the end of the season. The Premier League champions were made to work hard for three points by West Ham United earlier this week, while they were stifled for large parts of the game against Chelsea this past weekend as well. Add to it, Bournemouth’s solid form at home and the fact that they made light work of Chelsea not long ago, adds a sense of intrigue to Saturday’s fixture. However, injuries to key men has affected Eddie Howe’s side and considering how fragile they were made to look by Arsenal in the midweek, a comfortable victory for Pep Guardiola’s Manchester City seems the most likely outcome from the Vitality Stadium.